College Pro Days have arrived! A player’s performance at their pro day is extremely important to their success in the NFL draft because the day is often referred to as the last moment for a collegiate athlete to prove to scouts why they are worthy of the next level of play. Wednesday, March 18th, 2015 marked the day 7 Baylor players and 5 other athletes laid their skills on the line for 35 NFL scouts, including 3 quarterback coaches, at the Baylor University Pro Day. The magnitude of the event was evident from the get-go when the parking lot outside the Allison Indoor Practice Facility was blocked off for NFL Scouts. As the rain came down, people filed inside making two lines: media and scouts. 27 NFL teams were represented, as well as reporters from all over the country, including Scout.com and the Fort Worth Star-Telegram. Also in attendance were Baylor alumni Robert Griffin III and Terrence Williams. At 10am sharp the weight room doors were locked, to insure that no unwelcome visitors interrupted, and out came the contenders in their neon green official Baylor Pro Day shirts. A few chose to take to the weights while the majority made the decision to face the scouts and tell them they would not be lifting. The second an athlete announced their decision, the scouts riddled them with questions on why the athlete would not be performing the task. However, the coolest part was how pumped the athletes got when their teammate was on the bench lifting. It was quite a scene to see them hootin’ and hollarin’ in encouragement. After the lifting session scouts and reporters made their way to the Allison Indoor to await the players arrival for on field tests. Baylor’s Pro Day ran very similarly to the NFL Combine, especially during the physical tests, but on a smaller scale. Multiple athletes, including Glasco Martin and Antwan Goodley, demonstrated their talents in tests like the 40yrd-dash and the vertical jump. Baylor specialist Spencer Roth even had an opportunity to step outside and kick around two dozen punts for the scouts as punt-returner Levi Norwood received. 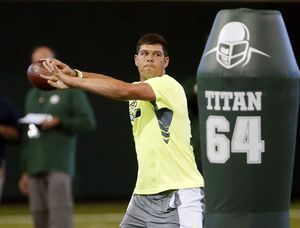 Bryce Petty completed 69 of 77 throws. Only 3 of the 8 incompletions were due to a poor throw while the other 5 were simply dropped balls. Petty took every snap from under center in order to address the concern that he may only be able to handle the shotgun style offense Baylor typically used, instead of a pro-style offense. As the Pro Day came to a close the media swooped in! 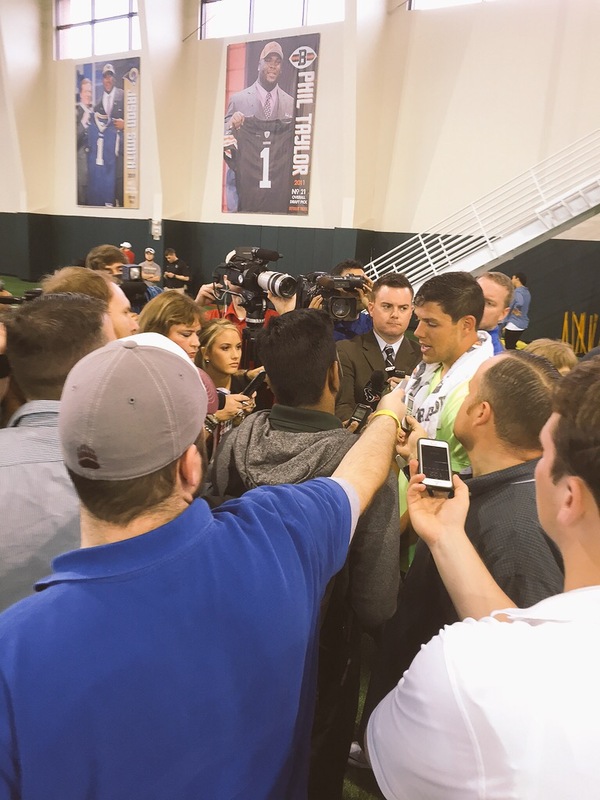 Whitfield stated, “That’s the best executed Pro Day I’ve ever been a part of, and I’ve been apart of some great ones.” Considering Whitfield has been apart of some greats, like Cam Newton, Andrew Luck, and Johnny Manziel’s, that statement speaks volumes for Baylor University and, specifically, Bryce Petty.